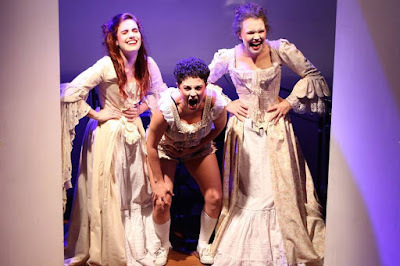 Glitterbomb presents, A PERIOD PIECE, Created by Carissa Licciardello, Gretel Vella and Company, at the Old 5o5, in Eliza St Newtown. 14-25 March. 4 actors: Julia Christensen, Matthew Lee, Julia Robertson (especially good), James Wright, and a musical Band of 3: Mikaela Atallah, Hannah Cheers and Clare Hennessy in (mock) period clothings in a Set Design that reminded me of a pallid version of the new Disney 'A Beauty and the Beast-look' (Production Design, by Nick Fry), present an hour, extended sketch show, written by Gretel Vella and Directed by Carissa Licciardello, called A PERIOD PIECE. In March 2015, Instagram took it upon themselves to remove a picture of a fully-clothed woman lying in bed with a teensy, tiny red stain on the back of her pants - because it didn't follow their 'Community Guidelines'. When movies abound with blood and gore and advertising with hyper-sexualised images of female bodies, but a stain the size of a 10c piece can cause moralistic uproar, we know we've got a problem - and a spectacular fodder for comedy. I reckon they are on the right track, but only sort of. The idea is terrific but the execution, relatively 'sloppy'. I know little about the female period, and my female companion thought that even a lot of her female friends didn't know much about the 'period', even though they knew of it first hand - on a monthly basis - and we were both quite expectantly startled into attention. No one talks of it much! We really did not come out at the end of the show with much more (clear) knowledge and instead, rather, just some generalised sense of a mock of it all. This 'track' then, still needs some more work. It is a fairly 'bumpy', intermittently interesting ride. Not all the material works, some of it is gratuitous - too long - and lacks crisp edginess - punchlines - and in production a lot of it of it is unnecessarily noisy - and that's not just the musical interludes, Ms Christensen! There is in this show more energy, cheeky 'joie de vivre', than the precise modulated skills, both of the vocal and physical kind to be able to pull this kind of daring comic stuff off. On view at The Old 505 was a kind of undergraduate tour-de-tongue-in-cheek. It is fairly well done, but not well done enough to cause unadulterated thrill. But, I reckon, they are of promise and ought to be encouraged. So, what's next? I was delighted to be with a young audience of gender parity filling this theatre and having a fairly good time.